Via di San Teodoro 8, Rome. We arrived late for our scheduled appointment. It’d be too easy to blame the strong Roman sun or our party’s casualness. Nonetheless, we were warmly received. I’d like to thank Nicola Sani, Alessandra Carlotta Pellegrini, and Barbara Boido who gave us their full attention during our visit. After some refreshing water and introductions, Ms. Pellegrini provided an overview of the Foundation’s history and aims, essentially to promote events that reflect Scelsi’s wide-ranging artistic and philosophical interests. Ms. Boido led us to Scelsi’s fourth-floor apartment, scrupulously maintained as a house-museum and used on occasion as a concert space. The rooms’ modest décor suggests the 1950s or early ’60s. 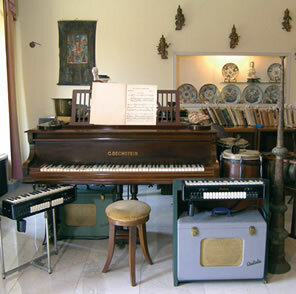 Instruments dominate the living area, with two electric Ondiolas flanking Scelsi’s Bechstein grand (see the cover image of a Foundation newsletter). A pair of reel-to-reel tape decks sits within reach of the piano bench. Furnishings include seating, display tables and a couch above which hangs a reproduction of Dali’s Couple au tête plein de nuages (1937), the original having been moved to the Museo d’Arte Moderna e Contemporanea di Trento e Rovereto (MART). Scelsi’s piano. Photo courtesy of the Fondazione Isabella Scelsi. Scelsi’s collection of exotic instruments covers the piano and built-in shelves. There is even a silent keyboard for practicing. Display cases in the hallway document the composer’s friendship with Jean Cocteau and others. One case features Scelsi’s Oriental caps with their vivid colors and patterns. One sees them also in the background of a Salzburger Festspiele 2007 poster (reproduced on another newsletter’s cover). A small back bedroom holds a blue canopied bed. On a table are photos of his mother and sister Isabella. Shelves throughout the apartment display photos of Eastern thinkers and philosophers. Late in life, Scelsi refused to have his picture taken (a few were captured at concerts and have since been reproduced in various recordings), and a photo of the young composer was included in the score of String Quartet No. 1 (1944). Ms. Boido led us to the rooftop terrace with its astounding views of the Palatine Hill, the Forum and the back of the Campidoglio. Scelsi felt great empathy for a particular palm tree across the street, high on the Palatine Hill, the vitality of which waned with his. The rear of the Campidoglio/Tabularum. The white structure just behind topped with statues of Victory on quadrigas is the back of the Monument of Victor Emmanuel II which some locals affectionately call the typewriter. The immediate foliage is part of the Scelsi Foundation’s roof garden. Descending to the Foundation’s ground floor after passing under what looked to me like an enormous gong, Ms. Pellegrini showed us the newly opened archives, equipped with top-line presentation and playback equipment. Customized software indexes over a thousand scores (most unpublished), letters, bibliographical material, and more than 600 private tapes. It’s possible to search on a variety of keywords against the archive’s more than 16,000 artifacts and to retrieve digitized copies. There are plans to make these resources Internet available. My family asks basic questions. Why do I like Scelsi’s music? What does it sound like? Recalling the hole I dug myself into attempting to explain my enthusiasm for Lachenmann, I kept it simple. I like Scelsi because he sounds like nothing else. His music effectively ignores the Western Canon’s forms, styles and most of its instrumental configurations. And yet Scelsi doesn’t appeal simply because he’s an outsider. For me, his wondrous sonorities convey fortitude. While Scelsi has few obvious imitators, it’s clear enough that the idea of the “single-note piece” held an appeal for composers as diverse as Cage and Nono, whose last pieces, among them Sixty-Eight (1992) and A Carlo Scarpa architetto, ai suoi infiniti possibili (1984) respectively, reveal Scelsi’s influence. 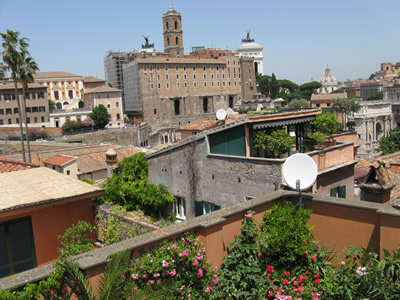 A view of the Roman forum from Scelsi’s roof. 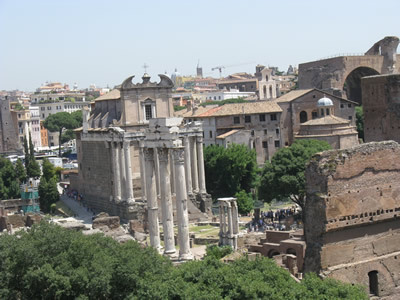 The three columns are from the Temple of Castor and Pollux, behind is the Temple of Antoninus and Faustina. The tall barrel vault at top right is part of the remains of the Basilica of Maxentius. As Count Giacinto Scelsi d’Ayala Valva, the composer was the last in line of a southern Italian aristocratic family. A 1980 earthquake hit the Naples region hard, damaging the town of Valva and the count’s ancestral castle. In Rome, Scelsi lived the life of an eccentric noble, hosting music soirées and parceling out his compositions to anointed players. After Scelsi’s death in 1988, composer Vieri Tosatti averred that it was he who wrote most of Scelsi’s compositions as far back as the First String Quartet. Tosatti described transcribing tapes and realizing scores from vague, abstract drawings. Most likely, Tosatti and Scelsi were collaborators: Scelsi would multi-track improvisations, selecting the parts he liked, purportedly playing them backwards if that proved more interesting. Tosatti would transcribe, and Scelsi would edit. Tosatti’s revelations have only served to enhance Scelsi’s reputation. Others who knew Scelsi or worked with him acknowledge the composer’s improvisatory methods while asserting Scelsi’s originality. “Scelsi,” whoever he may have been — and those who know say Tosatti’s music doesn’t approach Scelsi’s for inventiveness — is an essential figure in 20th-century music. A generation of musicians and composers views Scelsi as an aberration, and not simply because they suspect his working methods. I’ve known a few colleagues who grow red in the face at the mere mention of the man’s name. As Boulez put it, “… I knew him personally. He was a very intelligent man — nice and cultivated. But, I mean, he was an amateur, simply that.” It’s easy to understand how a composer brought up within and subsequently breaking with Western Classical Music’s traditions might dismiss him as a dilettante. I can only repeat that Scelsi’s music sounds like nothing else. For that at least it warrants our interest. 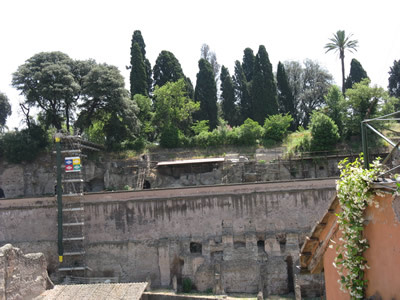 The Palatine Hill from Scelsi’s terrace. Scelsi’s beloved palm tree is at top right. Rome was the perfect environment for Scelsi. Notwithstanding Fascism’s architectural stabs, present-day Rome is a city of layers. Modern structures rub shoulders with Baroque splendor and crouch upon Imperial ruins. Scelsi’s daily view was a jumble of contradictions: unhurried excavation sites ringed by parked cars, satellite dishes blocking the view of Baroque domes. In Scelsi’s living room, electronic instruments share space with Eastern percussion. No surprise that his music balances juxtapositions and mysteries. 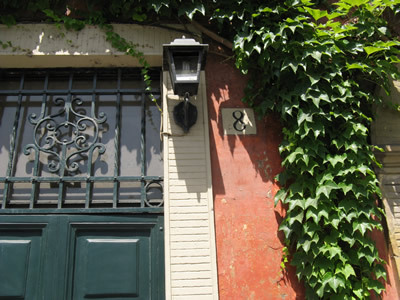 The Fondazione Isabella Scelsi (http://www.scelsi.it/) is located at Via di San Teodoro 8, 00186, Rome, Italy. Visitors to the Foundation and the Museo Casa Scelsi are requested to make advance appointments. For reviews of Scelsi recordings and related comments, see my Italian Vacation One, Three and Six. Older articles discuss separate solo-piano and orchestral releases. Recent issues requiring mention include Kairos 0012162KAI with the strings of Klangforum Wien under Hans Zender in Elohim, the Duo for Violin and Violoncello, Anagamin, Maknongan, Natura renovatur and String Quartet No. 4. The sixth installment of mode’s ongoing Scelsi series, mode 176, includes the Quattro Pezzi (su una nota sola) for orchestra. ARTS 47721-8 offers the world-premiere recording of Scelsi’s early piano Preludi, a spread of sketches from the 1930s and ’40s that reveals the composer finding his voice.